› Author AffiliationsFinancial support from the Supreme Council for Science and Technology Development, Academy of Sciences of Moldova (Project No. 15.817.02.14A) is gratefully acknowledged. V.K. acknowledges the ­Alexander von Humboldt Foundation for a postdoctoral fellowship. 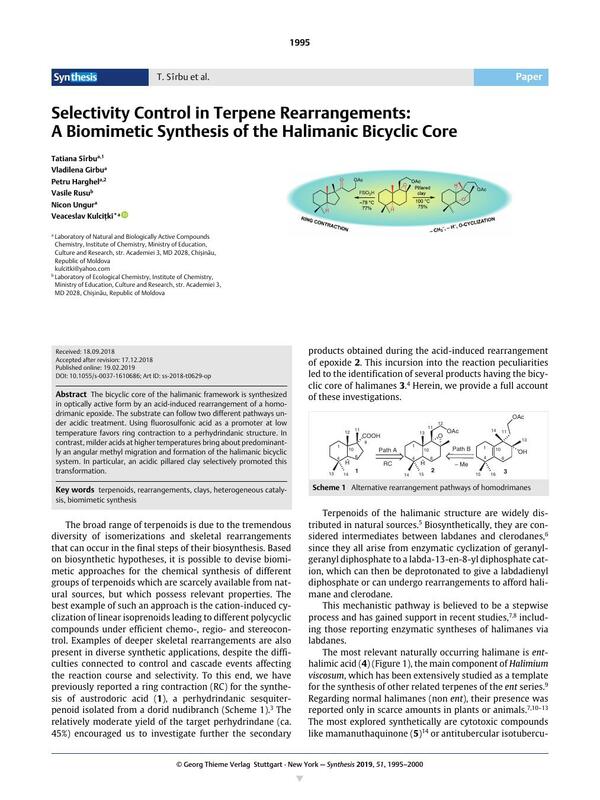 The bicyclic core of the halimanic framework is synthesized in optically active form by an acid-induced rearrangement of a homo­drimanic epoxide. The substrate can follow two different pathways under acidic treatment. Using fluorosulfonic acid as a promoter at low temperature favors ring contraction to a perhydrindanic structure. In contrast, milder acids at higher temperatures bring about predominantly an angular methyl migration and formation of the halimanic bicyclic system. In particular, an acidic pillared clay selectively promoted this transformation. Supporting information for this article is available online at https://doi.org/10.1055/s-0037-1610686. 1 Current address: Innotech Alberta, Hwy 16A & 75 Street, Vegreville, Alberta, T9C 1T4, Canada. 2 Current address: Flumed-Farm S.R.L., str. Cetatea Albă 176, Chişinău MD-2002, Republic of Moldova.